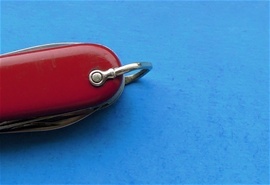 Victorinox went from using a shim for key ring on the main line in 1990. 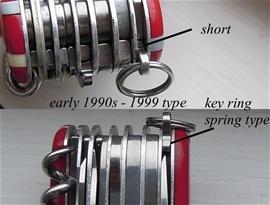 From 1991 the use of a spring with key ring was used. There are different variations of them. I will post some more. On the picture to the right is the one that is common today. One the picture to the right is a type used from 1991-1999. there is also a type between this and the common one today. Here is the type used and produced for only 3 months in 1999. This is between the two above. Again i would like to mention that this is on the main line and that i have seen this on knives after 2004 on advertising knives. There can be different reasons for this. On the main line it is correct 1999. For sure the key ring is older than 1968. At that date the Bail was officially replaced with a key ring. I do believe i received some information from a collector that the shim with key ring dates from the early 1950s. On the right is a knife with Bail from the mid-1960s. This was ended or replaced with a shim for key ring in 1968. 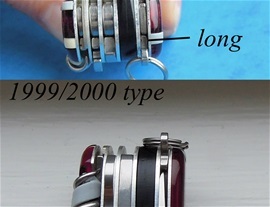 Here is a type used on the SuperTimer and the key ring spring design that is a bit special. This knife was introduced in 1990/91 and my knife is from 1991-1992. 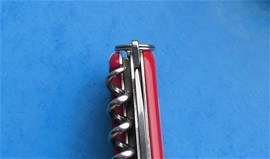 The corkscrew with decoration line ended in the early 1990s and the use of corkscrew without decoration line is complex because of other categories and applications. 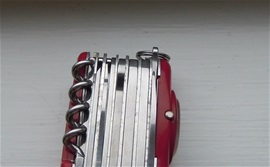 The use of no decoration line can be seen on knives in the 1980s and before. 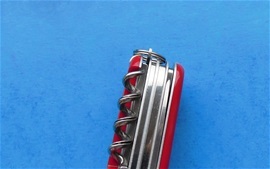 It is the main line that is most important and that is usually seen gone on knives with the introduction of the multi purpose hook. 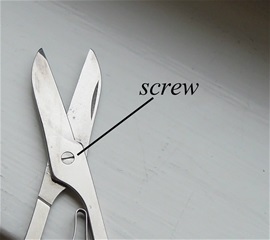 The use of a scissor screw design can be seen on knives up until the early 1990s.